Respected professor, avid researcher, and prolific author Carole T. Ferrand offers a brand new edition of her widely-read and highly-regarded resource for students and clinicians of the communication sciences and disorders. 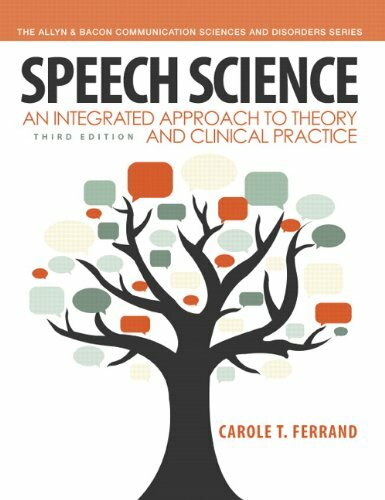 Speech Science: An Integrated Approach to Theory and Clinical Practice, 3/econtinues to highlight the close relationship between the scientific study of speech production and perception, and the application of this data to the evaluation and treatment of communication disorders. Dr. Ferrand integrates scientific material on the acoustics, anatomy, and physiology of speech production and perception with state-of-the-art instrumental techniques used in clinical practice to create the most comprehensive, detailed approach to the subject. While the focus of the book remains unchanged, the text now features a new re-organization for a greater flow of information, all chapters have been updated with current research, and additional integrative case studies have been included within many of the clinical chapters.